Hey everyone! 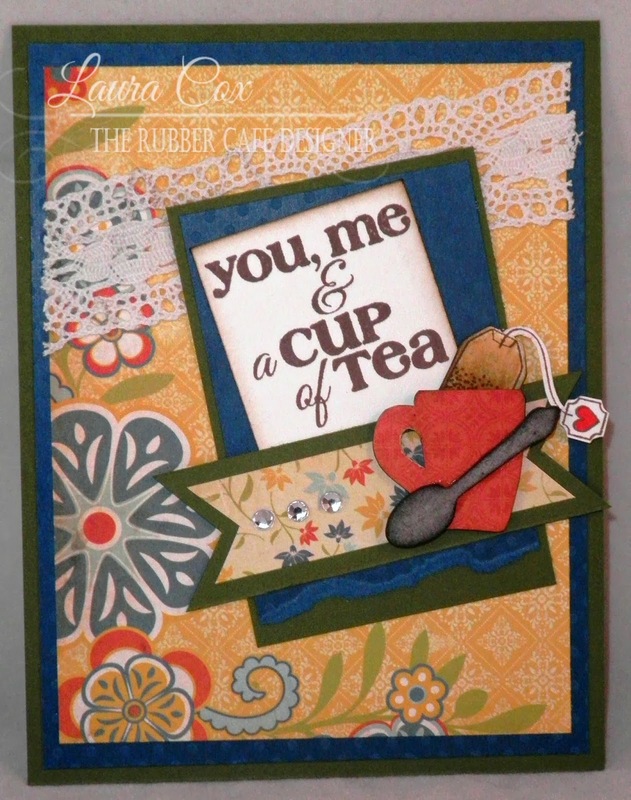 Laura here with a "tea-riffic" card for a friend created with The Rubber Cafe' Creative Cafe' Kit of the Month- Tea for Two. The lace was trimmed to fit across the patterned paper layer and all pieces were adhered using our Scrap Happy Glue. *TIP: Add an inch to your width to create a balanced rectangle piece if you don't want to bring out the die cut machine. First Layer: 3 1/4" x 2" piece of blue dot cardstock with the extra 1/4" torn off to give it a textured edge along the bottom. *TIP: The repetition of the colors from the large card base to the small center piece....this gives balance to a card and draws the eye into your focal point. Second Layer: Stamp the "you, me & a cup of tea" sentiment in Rich Cocoa Memento Ink on a white cardstock piece 1 5/8" x 2" long. Ink edges with Walnut Stain Distress Ink, and adhere to the blue dot piece at a slight angle. Cut V's in a 3 1/4" x 1" piece of olive cardstock, and in a 3" x 3/4" piece of floral pattern paper. Glue together and over the bottom edge of the sentiment piece. The teacup is a chipboard piece I traced on patterned paper cut out, then glued onto the chipboard piece and inked around the edges with Walnut Stain Distress Ink. The tea bag is stamped in Black Tuxedo Memento Ink and then inked lightly with Vintage Photo Distress Ink, then fussy cut out. The heart is colored with Copic R46. The spoon is also a chipboard piece, inked lightly with Black Soot Distress Ink, then inked again around the edges to give it depth. 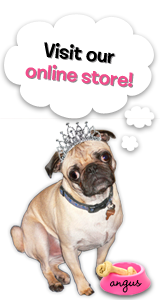 Using Scrap Happy Glue, add 3 small rhinestones for a touch of bling! Thanks for stoppin' by the Cafe' today....hope you enjoy this kit as much as we are! Very cute card! It warms me up!